This is the first in a series of essays in which I hope to examine the history of American religious liberty—in particular, the backstory, interpretations, and shifting moral valence of the Establishment and Free Exercise Clauses of the Constitution. “The past is never dead. It’s not even past.” The immediate historical backstory against which the Establishment Clause is set is the institution of the European state churches that impelled many colonists to leave Europe in pursuit of religious freedom. Most historical accounts of the Establishment Clause begin and end here. But the background of European state churches is the Peace of Westphalia, the religio-political wars that preceded it, and the Reformation. Some historical accounts reach this far back. But to thoroughly understand the significance of the Establishment Clause I think we need to reach further—all the way back to pre-history. This type of society is superlatively “thick,” in contrast to the “thin” society prescribed by liberalism à la John Rawls. For Rawls, the right of the individual to self-determination in most matters, including especially the matter of one’s ultimate views—what Rawls calls one’s “comprehensive doctrine”—must trump society’s arguable interest in unity. Society must instead be bound together by “overlapping consensus” with regard to the procedures for decision-making and certain limited values that all (or a sufficient majority) share in common. A tribal society, by contrast, has no room for multiple “comprehensive doctrines.” To be sure, it would be inaccurate to say there is no room for individuality in a tribal society: individuals are never reducible to the sum of their social roles and relations. The individual necessarily remains the locus of concrete perception and emotional experience, and individuality is always free to find expression within certain bounds. The bounds are concededly narrower in a tribal society, though. Individuality is correspondingly “thinner” as society is “thicker.” Tribal individuals are not free to pursue their own idiosyncratic visions of the Good, except within the thick social framework with all its norms and duties. But in exchange for this freedom, the tribal individual receives a holistic belonging within a structure of shared meaning and values that modern society lacks. As we will see, the shift from “thick” to “thin” society in Western history has been a product, not of a deliberate choice resulting from a weighing of the options, but rather of necessity resulting from (among other things) (1) the formation (largely through military force) of power centers that controlled territory of a vaster scale than is manageable by tribal government, (2) the development within such far-flung societies of intractably differing “comprehensive doctrines,” and (3) the rise of the individual as the primary bearer of legal and moral rights in modern ideology. The shift obviously has its pros and cons. One does not wish for a return to the good old tribal days, but one may hope that, within the context of our liberal democracy, the benefits of “thick” belonging may be recognized and fostered, and the detriments of extreme individualism curtailed. In what follows in this section, it will not be possible to attempt anything more comprehensive than to trace the broad outlines of the history of this shift, subject to critique and revision by those more expert in parts of it than I. The first thing to be mentioned, perhaps, in this outline of the shift from “thick” to “thin,” is the agrarian revolution and the rise of urban centers and empires. These new forms of society, so far as they extended, partially displaced tribal society. An empire is necessarily “thinner” than those societies: ties of daily interaction, common ancestry, and local allegiances are loosened: one is related more tenuously to someone on the other side of the empire, if at all, by a more distant ancestry, social relations five or six degrees removed, and possibly a common interest in the military and political security and stability of the region. The superstition of the people was not embittered by any mixture of theological rancour; nor was it confined by the chains of any speculative system. The devout polytheist, though fondly attached to his national rites, admitted with implicit faith the different religions of the earth. Such syncretism served, in many parts of the world, to harmonize and reconcile differing beliefs. But always the interests of the state and People were paramount. As soon as the Jews or Christians threatened the stability of the city or the empire by professing a loyalty higher than and in tension with loyalty to the state, freedom gave way to the civic need for order and obedience. And once Christianity was recognized as an important force in Roman civic life—even before it became the established religion—the civic need for unity in doctrine and practice was deemed superior to the need for an open theological and religious forum. The Catholic Church partially filled the power vacuum left by the fall of Rome, competing for power with local governments, kingdoms, and (eventually) nations. It was a defining feature of medieval Europe and a (mostly) unifying influence that served (mostly) to temper and mitigate the violent struggles of kingdoms and states. Catholic beliefs and authority functioned as common ground on many of the most fundamental issues—a rich source of political consensus and an intellectual and spiritual forum common to all. Heresy was punishable by death not only because of the danger it posed to the salvation of the heretic and of others, but also because it threatened the very fabric of Western society. In late polyphonic music the central aspect is the delicate interplay of voices without any single one of them taking precedence. In music of a century later we find the dramatic use of a powerful individual voice, but in fifteenth-century English polyphone the emphasis rests upon the intricate melody of many voices. The character and abilities of the individual are only of consequence as an element within the harmonious organization of parts; we do not know the names of the masons who created the bell towers and fan-vaults of the great fifteenth-century churches. This is not the world of Luther or of what has become known as post-Reformation culture, but it remained the world of Thomas More. In this pre-Reformation world of “harmonious organization,” the cultural life of the people is exemplified in the Catholic rituals. The Mass culminated in the Eucharistic Liturgy, which was a “participation in the body of Christ.” Until the meaning of this ritual became contested, it tied the body of Christ and the bodies politic together. Medieval cosmology posited concentric spheres (each containing a celestial body) that rotated within one another, producing heavenly music—and medieval thought considered society as a microcosm of this same order: the individual was situated within the family, and the family within the village—and all Christendom formed the outer sphere, the body of Christ, of which all were “members.” It is no wonder, then, that the competing formulations of the doctrine of the Eucharist was perhaps the most important and contentious doctrinal issue fought over during the Reformation. Indeed, the Reformation was in part a paring back of religious ritual in general. Salvation and election were personal rather than communal; inner faith and divine grace were the essential things, not good works or sacraments. Each person was to consult the Bible directly, and not to depend on the formerly authoritative traditions and interpretations. In more than one way, then, the Reformation “thickened” the individual and “thinned” society. Ritual, however, need not be religious in nature. For current purposes, ritual might be defined (very broadly) as engaging in prescribed behaviors that produce shared meaning. Such behaviors are called rites, rituals, procedures, ordinances, ceremonies, social forms, etc., depending on the context. By this definition, paying for one’s groceries at the register is a type of civic ritual, as is the passage of a law: both forms of action consist in prescribed behaviors that produce shared meaning. By ritual our societies enable us to order our lives and make our actions mutually intelligible within our social contexts. In other words, through ritual societies in some degree imitate the cohesiveness and formal unity of an individual. Thus, the metaphor of the body politic remains forceful and appropriate today, even though it is generally no longer thought to be incorporated within the body of Christ or any other metaphysical entity. The Reformation was the confluence of various forces: among others, the printing press and the vernacular Bible, the spiritual and theological crusades of Luther and other reformers, and princes in search of greater sovereignty and independence from Rome. But one thing that played no role whatsoever was the judgment that religious pluralism would be a better system than the unity of Christendom. The Reformers, from the Catholic perspective, were schismatic. But from their own perspective, as their name suggests, they were merely calling Christendom to repentance. They sought uniformity just as avidly as the Catholic powers—but not at the expense of correct doctrine. Until religious wars had bled Europe for most of a century, it was unthinkable that the unity of the Christian faith be abandoned. Salvation was at stake—as was the continued coherence of Western society. It was only when the comparatively “thick” unity of a common religion became manifestly impossible that Europe resigned itself to religious pluralism. The 1648 Peace of Westphalia was not, from the contemporary perspective, a triumph of liberalism, but rather the defeat of a universally cherished goal—a deal with the devil, one might almost say, to secure peace. Thus it was that each prince was empowered to choose the religion of his realm. But the proverbial cat was out of the bag. The Peace of Westphalia implied that correct doctrine was now a matter of debate: providence had not caused either side to prevail in the physical or intellectual fields of battle. Equally important, all sides valued correct doctrine and salvation above the unity of Christendom—and so, perforce, also above the unity of any kingdom or commonwealth. Religious warfare no longer existed as a general conflagration, but fires would be flaring up in seemingly every nation for the next several centuries. The Enlightenment followed the Reformation, filling out the philosophical system of this brave new world of individuality with theories of natural rights and freedoms bestowed on each person at birth. According to Rousseau, for instance, humankind is “born free, and he is everywhere in chains.” Possibly Rousseau was not especially familiar with babies, having caused his own to be “taken to the foundling hospital” and adopted by someone else. Babies are anything but “free,” and they grow into their freedom, if at all, only through the travail of their parents. Still, though, Rousseau’s rhetorical excess serves to highlight how the Enlightenment (with exceptions such as Hobbes) helped shift the focus of the Western intellect and legal systems to the rights-bearing individual. Locke is the paradigmatic case of this shift; he constructs his theory of the social contract from the basis of the individual in a state of nature, and concludes that “[e]very man . . . [is] naturally free, and nothing [is] able to put him into subjection to any earthly power, but only his own consent.” From this he concludes that (for adults at least) there is no “perpetual tie of subjection and allegiance” to any earthly authority (one’s family included), except as the individual should choose at each given moment—by, for example (in the case of allegiance to a nation), remaining within the jurisdiction of the state and enjoying its protections. Certainly there is something to be said for freedom of movement between countries and freedom to achieve independence from familial expectations. But most people would say that there is a natural tie of allegiance that binds one to one’s family and nation, and puts one “into subjection” to them long before one may “consent” to anything. Even after one grows into one’s individual freedom, many would agree that one owes allegiance to these social bodies: allegiances that one cannot lightly discard, and generally ought not discard at all, whatever ones preferences may be, unless an ever higher allegiance demands it. Locke’s individualism was mirrored, both across the English Channel and across the Atlantic Ocean. Some of the philosophes called for religious tolerance, not just for each sovereign state, but for each individual, based in part on the bloodshed caused by religious strife in France and elsewhere. 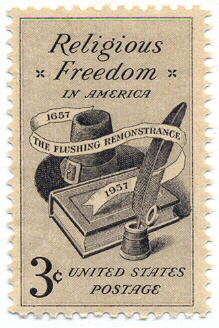 The American founders, reading Locke, Voltaire, and Montesquieu, likewise recognized an individual right to choose one’s religion and propounded the virtue of religious tolerance, although it was perhaps the evident incompatibility of civil peace and established religion in the post-Reformation world that provided the primary impetus for placing the religion clauses at the opening of the Bill of Rights. The Religion . . . of every man must be left to the conviction and conscience of every man; and it is the right of every man to exercise it as these may dictate. This right is in its nature an unalienable right. It is unalienable, because the opinions of men, depending only on the evidence contemplated by their own minds cannot follow the dictates of other men: It is unalienable also, because what is here a right towards men, is a duty towards the Creator. It is the duty of every man to render to the Creator such homage and such only as he believes to be acceptable to him. This duty is precedent, both in order of time and in degree of obligation, to the claims of Civil Society. Believing with you that religion is a matter which lies solely between man and his God; that he owes account to none other for his faith or his worship,—I contemplate with sovereign reverence that act of the whole American people which declared that their legislature should ‘make no law respecting an establishment of religion or prohibiting the free exercise thereof’ . . . . In claiming that “man . . . owes account to none other” than God “for his faith or his worship,” of course, Jefferson implies that man does owe account to God for the performance of these duties. The difference between self-determination and conscientious duty is a subtle one. Conscientious duty might be thought of as a special sub-category of self-determination. To obey the dictates of conscience is to be determined by one aspect of the self—the conscience. But it is equally not to be determined by any aspect of the self that runs contrary to the conscience. “Self-determination” is therefore a vaguer concept than “conscientious duty,” and means, roughly, to be determined by internal rather than external forces, whether the internal forces be those of the conscience, intellect, and care for others or those of passion, prejudice, and self-love. We have no government armed with power capable of contending with human passions unbridled by morality and religion . . . . Our Constitution was made only for a moral and religious people. It is wholly inadequate to the government of any other. Men are qualified for civil liberty in exact proportion to their disposition to put moral chains upon their own appetites,—in proportion as their love to justice is above their rapacity,—in proportion as their soundness and sobriety of understanding is above their vanity and presumption,—in proportion as they are more disposed to listen to the counsels of the wise and good, in preference to the flattery of knaves. Society cannot exist, unless a controlling power upon will and appetite be placed somewhere; and the less of it there is within, the more there must be without. It is ordained in the eternal constitution of things, that men of intemperate minds cannot be free. Their passions forge their fetters. Clearly, to many of the best of the 18th-century minds, the self was not a beneficent entity that, absent constraint, would flower and bloom. This is the vision of selfhood that seems the underlie the modern doctrine of the “free and full development of personality” as a fundamental right, but it would have seemed strange to the framers. To them, the self was rather an ambiguous, indeterminate germ containing the potentiality to grow either into a fruit-bearing branch of the body politic or into a choking weed—and indeed, a germ that without the soil of society would grow into precisely nothing, but shrivel in the sun. Society was to guide and constrain this germ, nurturing the fruit-bearing aspects and pruning the weed-like qualities. Religion was, according to Adams, an essential part of that nurturing and pruning process. And yet the Establishment Clause declared that as to conscientious duty in matters of religion, society was not to constrain individuals. The view of John Adams, Burke, and others is made more transparent when one recognizes that law, morality, and religion share a common structure. Each constitutes an external authority that makes demands on individuals. When the framers spoke of “liberty,” it was not any absolute or free-wheeling liberty, but a liberty to submit to civil laws that one had a hand in forming, and to moral and religious principles as dictated in part by society—but in part also by one’s own reason and conscience. The Establishment Clause was a radical new experiment. While history is not entirely devoid of precursors to the American system (most importantly, there is the prior peaceful co-existence of the colonies themselves), never before had a state forsworn religious establishment. Indeed, through most of human history and pre-history, religious unity was central to most communities’ sense of peoplehood—an important “layer” in the “thick” belonging of the people. We evolved in tribal communities where plural “comprehensive doctrines” were not and could not have been an option. In the early United States, however, it was clear that coercion in the fundamental matter of religion would be incompatible with the survival of the Union—but it was not clear whether religious pluralism might not be equally incompatible with its survival. The liberalism experiment needed to be tried—but rarely (never?) had pluralism in religion been not only tolerated but established—and who knew what the result would be of fostering heterogeneity with respect to (1) the citizenry’s highest loyalties and (2) their beliefs about ultimate realities. Might not this particular “layer” turn out to be essential to any lasting union? There was a related concern, then current, that to allow multiple sovereigns in a single jurisdiction might lead inevitably to civil war—hence, in part, the clout of the anti-Federalists. After all, the dual sovereignty of parliament and the monarch in English history had led to the English Civil War. The American Civil War would eventually lend credence to this concern, even as it rendered the issue partially moot by establishing the federal government as the master of the states in various crucial respects. Similarly, it was not unreasonable to fear that disunity in these deepest and highest matters of religion would lead ultimately to the dissolution of We the People. Nobody seems concerned about religious pluralism now. Yet it may be too early to declare the experiment a success. Society has continued to grow thinner as multiculturalism has taken root. As time goes on we have less and less in common with most of our neighbors with regard to our ultimate convictions, and it is anybody’s guess where this trend eventually leads—but the current outlook suggests that, as one would guess, it leads towards disunion. The contemporary “culture wars,” the polarization of the political world, and the weakening of the local ties that largely bind our nation together (the breaking up of families, the “bowling alone” phenomenon, etc. ), announce that the outcome of the liberalism experiment is not yet settled. William Faulkner, Requiem for a Nun 92 (1951). See David Hollenbach 13-15, The Common Good and Christian Ethics (2002) (discussing how this history informs the Establishment Clause). See generally E. A. Allen, The Prehistoric World: of, Vanished Races (Nashville Central Publishing, 1885), available at http://www.gutenberg.org/files/2873/2873-h/Title.html. Shelly Ashdown, Tribal Religions from the Heart: Hebrew LĒB and Torobo Oltau, 12 J. for the Study of Religions & Ideologies 153 (2013) (quoting Carolyn Morrison et al., Permanency Through Wabanaki Eyes: A Narrative Perspective from ‘The People Who Live Where the Sun Rises, 89 Child Welfare 108 (2010)). Rawls refers to a “thin theory of the good” in contrast with a “comprehensive doctrine.” See John Rawls, Political Liberalism 178 (Columbia University Press 1993). The “thick” and “thin” metaphor possibly predates Rawls, but at any rate it has been taken up by various participants in the discourse of political theory. See, e.g., William R. O’Neill, S.J., Modernity and Its Religious Discontents: Catholic Social Teaching and Public Reason, 20 Notre Dame J.L. Ethics & Pub. Pol’y 295, 311 (2006) (“But human rights are not a moral Esperanto. What the Universal Declaration affirms as our ‘faith in fundamental human rights, in the dignity and worth of the human person’ is typically grounded in comprehensive narrative traditions—whether these be sacred, e.g., ‘Catholic moral-religious tradition,’ or secular, e.g., comprehensive liberalism. Public reasoning translates our ‘thick’ grounding reasons, e.g., religious faith, into the properly political discourse of ‘thin’ public reasons, e.g., political faith in rights.”). Edward Gibbon, 1 The History of the Decline and Fall of the Roman Empire 36 (Fred De Fau 1776), available at http://oll.libertyfund.org/titles/1365. See, e.g., Alister E. McGrath, Christian History: An Introduction 1 (2013) (detailing how Christians began to be persecuted in Rome). Peter Ackroyd, The Life of Thomas More 44 (1998). 1 Corinth. 10:16 (New International). See McGrath supra note 12, at 193-194; see generally John Foxe, Foxe’s Book of Martyrs (1563). Catherine Bell, Ritual: Perspectives and Dimensions 4 (1997). See McGrath supra note 12, at 211 (“The populations of many regions were decimated through [the Thirty Years War] . . . [and] any remaining enthusiasm for religious warfare had evaporated. People had had enough.”). Wars were never (or almost never) purely religious, even before the Peace of Westphalia, but there seems often to have been a religious component to European wars during the 18th and even 19th centuries. See List of conflicts in Europe, Wikipedia.org, https://en.wikipedia.org/wiki/List_of_conflicts_in_Europe#18th_century (last visited Mar. 3, 2016). Jean-Jacques Rousseau, The Social Contract 49 (Penguin 1968). Jean-Jacques Rousseau, The Confessions 333 (Penguin 1953). John Locke, Second Treatise of Government 63 (Hackett 1980). Wendy McElroy, The Origin of Religious Tolerance: Voltaire, Independent Institute (Jan. 5, 2008), http://www.independent.org/newsroom/article.asp?id=2095 (“Voltaire . . . published . . . Letters Concerning the English Nation. Although written in French, the twenty-four letters first issued from London in an English translation, because the material was considered too politically dangerous to the author and to whomever [sic] printed it for the work to appear in France. . . . Letter Five, On the Church of England, began with the observation, ‘This is the country of sects. An Englishman, as a freeman, goes to Heaven by whatever road he pleases.’ The statement had profound implications for any citizen of France—a nation that had almost destroyed itself in order to establish Catholicism as the only practiced religion.”). James Madison, Memorial and Remonstrance against Religious Assessments, The Founders’ Constitution, http://press-pubs.uchicago.edu/founders/documents/amendI_religions43.html (last visited Mar. 2, 2016). This passage is quoted in the first Supreme Court Establishment Clause case (regarding Mormon polygamy), citing to “8 Jeff. Works, 113.” Reynolds v. United States, 98 U.S. 145, 164 (1878). McCreary Cty., Ky. v. Am. Civil Liberties Union of Ky., 545 U.S. 844, 887-88 (2005) (citing to Letter (Oct. 11, 1798), reprinted in Volume 9 of Works of John Adams 229 (C. Adams ed.1971)). Edmund Burke, Letter to a Member of the National Assembly (1791), in Volume 4 of The Works of the Right Honorable Edmund Burke 51–52 (1899). Many European courts recognize this right and employ this language, which originated in the Universal Declaration of Human Rights. See generally Robert D. Putnam, Bowling Alone: The Collapse and Revival of American Community (1999). Wonderful Essay! I learned much important information! A beautifully written and illuminating essay. I’m eager to read part 2. Several thoughts occurred to me as I read part 1. Thank you for the appreciative and very intelligent comment. I agree with everything you say, and thanks for clarifying England’s special role in the historical development. It was a pleasure to reread Bushman’s essay. It’s a good reminder that there are dangers in both extremes.